Basiliscus plumifrons is one of the largest basilisk species. This lizard is able to run short distances across water using both its feet and tail for support. This has earned the green basilisk the nickname “Jesus Christ lizard”. It is also an excellent swimmer and can stay under water for up to 30 minutes. 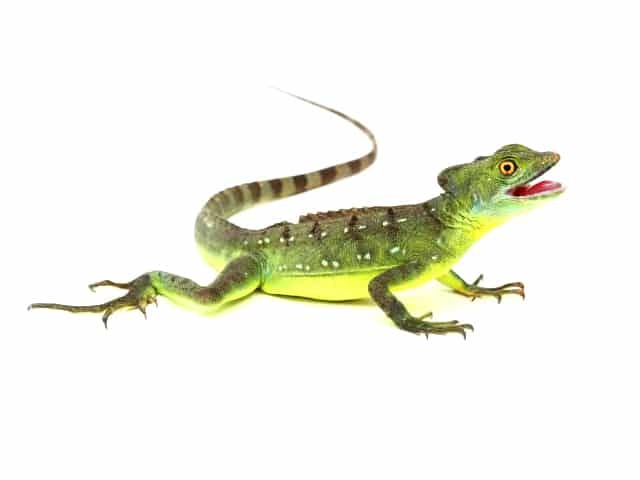 Adult Basiliscus plumifrons are brilliant green with bright yellow eyes and small bluish spots along the dorsal ridge. Males have three crests: one on the head, one on their back, and one on the tail while the females only have the head crest. Juveniles are less conspicuously colored, and lack the characteristic crests. Green Basilisks are a larger species and can attain up to 0.9 meters (3 feet) in length. The general rule of thumb for caging is that you want to provide an enclosure that is at least twice the length of the lizard. There are many different caging options for Green Basilisks, they can range from simple indoor setups to large and elaborate outdoor enclosures, the latter being the preferred option. Screen cages are a poor caging option since these do not hold in humidity. An adult pair can be housed in an enclosure that is 1.8 x 0.6 x 0.9 meters (6 x 2 x 3 feet) or larger. Unless breeding, Basilisks don’t require a hide. They will do well with sufficient cover in the form of fake/live plants, branches and ledges. These lizards do best on a substrate that holds moisture such as dirt, bark or moss. I strongly advise against the use of bark or wood chips for these lizards as they are very voracious eaters and ingestion of these substrates can potentially lead to impaction, I have personally lost an animal to this in the past and have since switched to a mixture of dirt and moss. Green Basilisks inhabit the dense rainforests of South America where they receive diffused sunlight. This can be replicated with an appropriately rated UVB bulb. These lizards also require a raised basking spot to thermoregulate. This basking spot should be maintained at a temperature that allows the lizards body to reach 32 °C (90 °F). This can easily be checked by using a temp gun which can be purchased at most hardware stores. Ambient temperatures during the summer should range between 29-31 °C (85-88 °F). During the winter, day temperatures can be allowed to drop into 21-24 °C (71-75 °F) and during the night into 18-19 °C (64-66 °F). This is especially important if you are trying to stimulate breeding. Basilisks should always be provided with a clean water source such as a large sturdy water dish. More elaborate setups may include a filter or drainable water source for easy cleaning and changing. These lizards come from tropical rainforests and require a good amount of humidity. Humidity levels should range between 60-80%. This can be maintained by using foggers, misters or spraying daily with warm water. Babies should be fed crickets or roaches dusted in calcium and vitamins every other day. These should not be larger than the lizards head and only offer as many as the lizard will eat in one sitting. Later on you can begin including snacks such as super worms and goliath worms. Adults can on occasion be fed fruit. Berries such as raspberries and blueberries are particularly relished by Basilisks. These lizards generally don’t like to be handled. 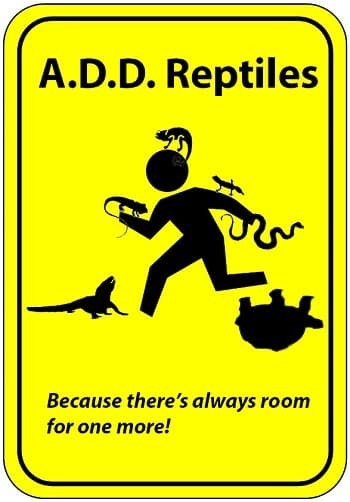 This is especially true with wild caught specimens. Normally when approached they will bite or take off and start bouncing off the walls of the enclosure which can lead to injuries and stress. If you are looking for a calm and easily handled lizard then these animals are a poor choice. If you feel that you must handle your Basilisk then you can try and slowly start building trust with the animal. Try offering some food from a pair of tongs, once they start eating off the tongs then see if they will eat from your hand. Once they associate you as the nice keeper who feeds them you can start trying to slowly pick them up without restraining them, do this close on the ground so they don’t hurt themselves if they jump off. After about a year of building trust you will start to see a major improvement in their attitudes. lizards generally aren’t known to be big mess makers. Usually a weekly spot cleaning of the enclosure is sufficient. Complete substrate changes can be done every 3 months or so. These lizards rarely have any trouble shedding if at least a daily misting is being provided. Captive bred Basilisks are normally very hardy lizards; wild caught specimens on the other hand almost always come with parasites and should be quarantined and dewormed immediately. Since these are very nervous lizards nose rub is a common issue, this is why it is important to provide them plenty of cover so they feel secure. A little nose rub can be treated with Betadine but more serious cases may require veterinary assistance. Another potential problem is their voracious feeding habits; these lizards have a tendency to go after more crickets while still chewing on another which usually leads to them ingesting some substrate. Dirt can be easier to pass but you can run into serious trouble if the lizard ingests any bark or chips as this will normally lead to some form of impaction. Impaction is a serious reptile emergency that normally requires vet care to resolve. Otherwise Green Basilisks are a very hardy, fun and interesting species to keep.